You get 4 times the power of the sun with the EYE XER-W83. 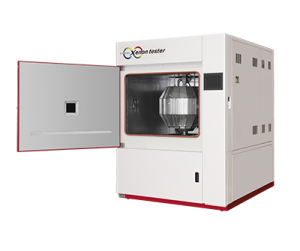 This is a state of the art Xenon weathering test chamber designed to perform global standards testing on all types of materials. 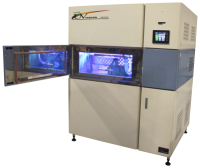 Two sample frame options are available that offer either standard 1-sun equivalent full spectrum irradiation, or industry leading 4-sun equivalent full spectrum irradiation. 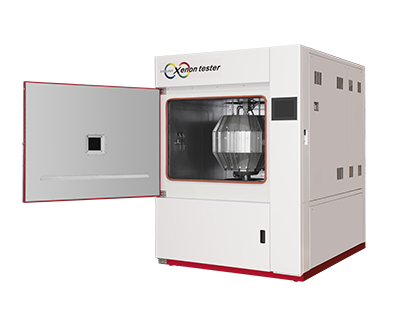 The XER-W83 system simulates the degradation caused by full spectrum sunlight, rain, humidity and temperature, and is designed for maximum flexibility to provide a single test system compliant with global automotive, textile, plastic, paint and other test standards. 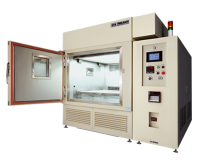 Options include a large sample frame holder with 10,920 cm² target area and 30-120 W/m² irradiation, or a mid-size sample frame holder with 5670 cm² target area and 48-200 W/m² irradiation. The system includes a built in data-logger for data storage and simple transfer to common programs such as MS-Excel. All weathering parameters and cycle functions are fully programmable including temperature, humidity, water spray, full spectrum irradiation, rest (night time), and cycle/duration timing. Up to 200 W/m² of sunshine replicating, uniform UV and Full-Spectrum coverage between 295-800 nm. Programmable test setup including irradiation, dark, shower, RH% control cycles. Repeatable results with correlation to outdoor testing. Compliant with existing global test standards. Download the Xenon XER W83 Spec Sheet here.